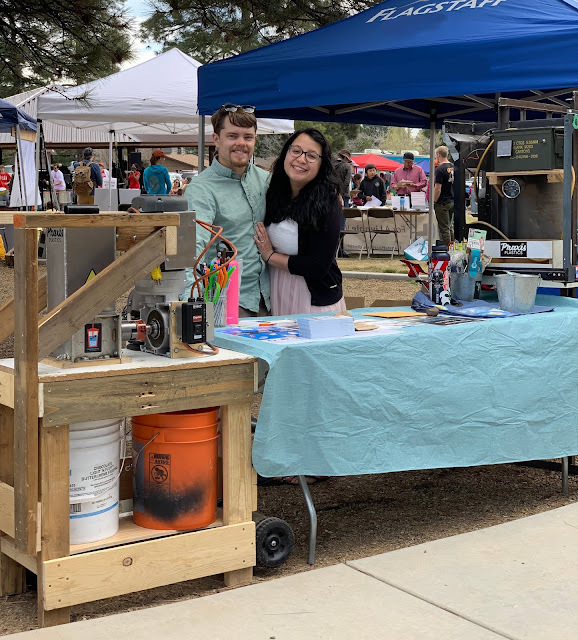 Fran and I were happy to table with The Azulita Project at Flagstaff's 2019 Earth Day at Bushmaster Park! Here we are posing with Vice Mayor Adam Shimoni right before loading the machines back into the truck. It wasn't as hot as last year but we still both got sunburns! Thanks to Mia Trujillo from the next table for taking our photo! I will update this space if I can find any more publications with pictures of our table. 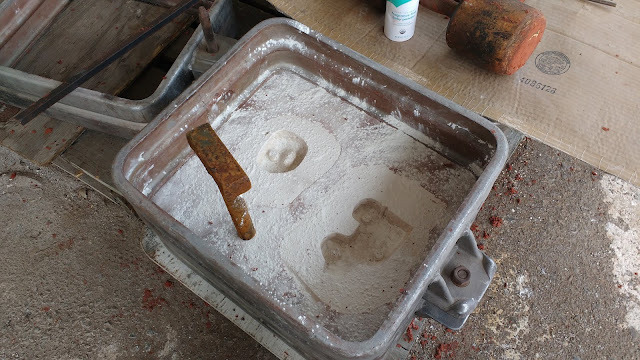 We left off on Step 5, packing sand into the casting box. I came back a different day to finish. Step 6: Gently remove the pipe from the fill hole. Pick up the upper half of the box and flip it over. Step 7: Inspect the clay. We can see here that they jeep's tire fell apart on disassembly. It turns out there is a small undercut in the plaster mold which caught the clay and ripped it apart. Step 7b: I did extensively trim the jeep mold in hopes the draft angles would work out, then repacked the second box. But because I missed that undercut the second one didn't work either. I decided to scrap plans for the jeep in the first round so I could at least get one out. Step 8: Remove the plaster pieces and reassemble the box. 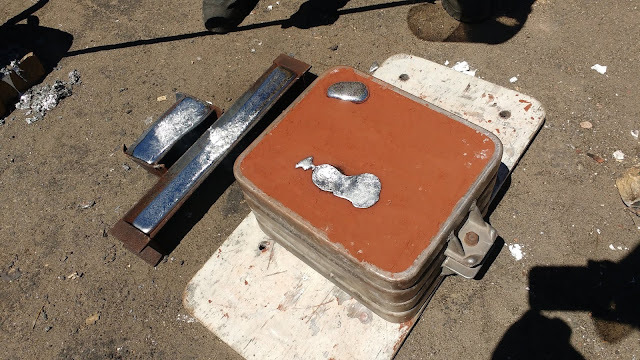 Melt scrap aluminum in a foundry (I used Northern Arizona University's foundry) and pour it into the feed hole (bottom). The metal will bubble up through the vent hole (top) and then you know it's ready. Let it cool for at least a half hour. Step 9: After the exposed aluminum is cool enough to touch, start digging the sand out. Remember that the aluminum will be HOT inside the sand, so avoid touching it below the very top 1/4"/5mm. 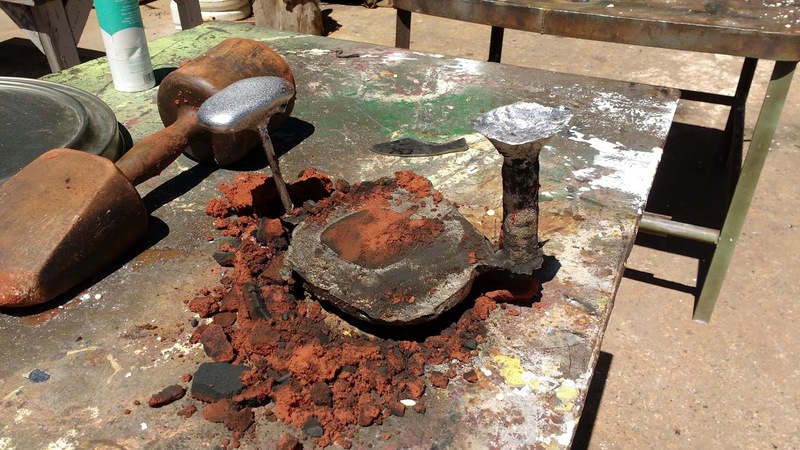 After you've removed the sand on top, use foundry tongs to remove the casting from its box. Step 10: Clean the sand out of the casting and break or saw off the feed tube and vent tube. 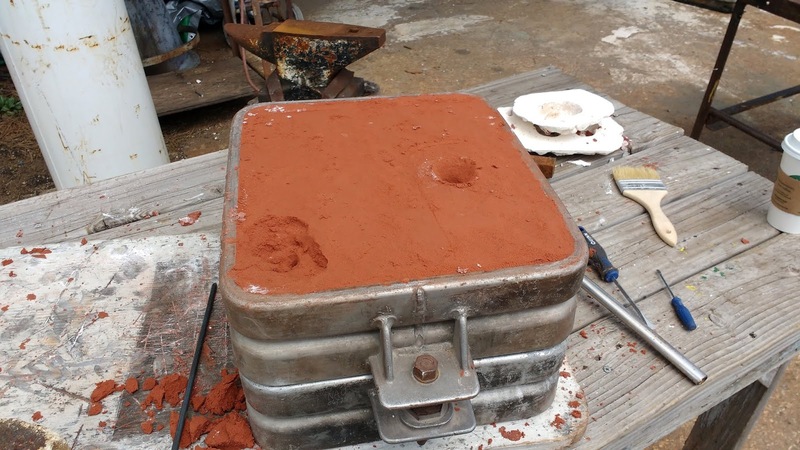 Throw any aluminum waste back into the scrap pile for the next casting. Below is a photo of the other side. I was thankfully able to make the edges thicker by scraping out some sand in step 7. 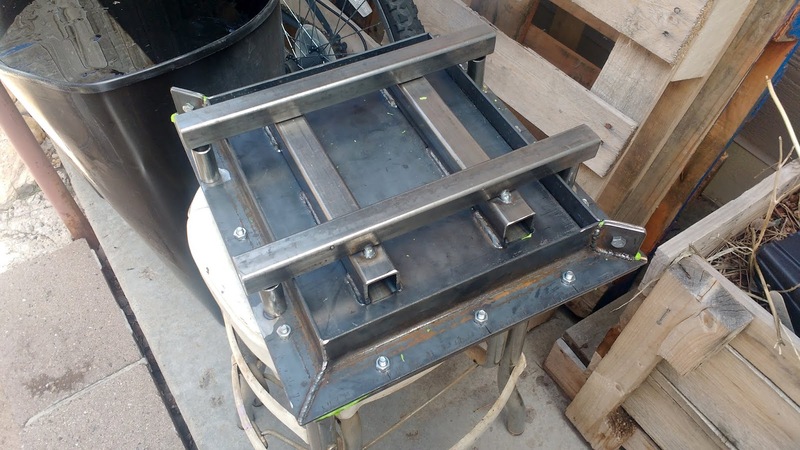 This will give me a little heavier-duty mold with more material to work with. Next steps: I will use the angle grinder to clean up this casting's backside and make a good shelf for bolts to go through. Then I'm going to put the front side on a belt sander to make it nice and smooth. The flat side there has to mate up to a steel plate, so I'm guessing the smoother it is, the better the molding process will go. Stay tuned! 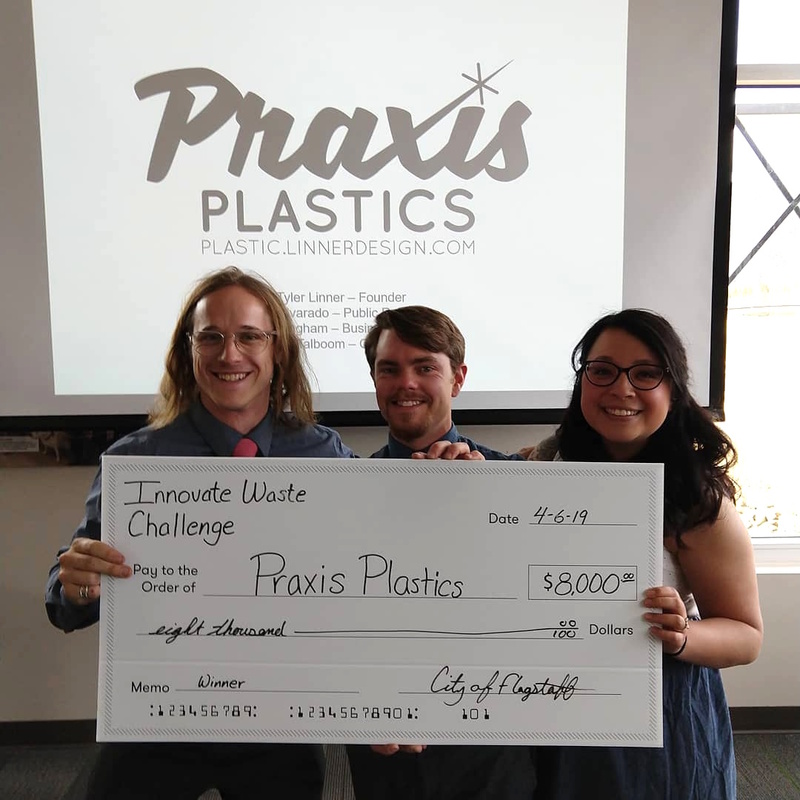 Praxis Plastics, as a team of me (Tyler Linner) as founder, Darren Bingham as business outreach coordinator, and Fran Alvarado as public relations coordinator, are ecstatic to announce that we've won $8,000 through the City of Flagstaff and NACET's Innovate Waste Challenge. 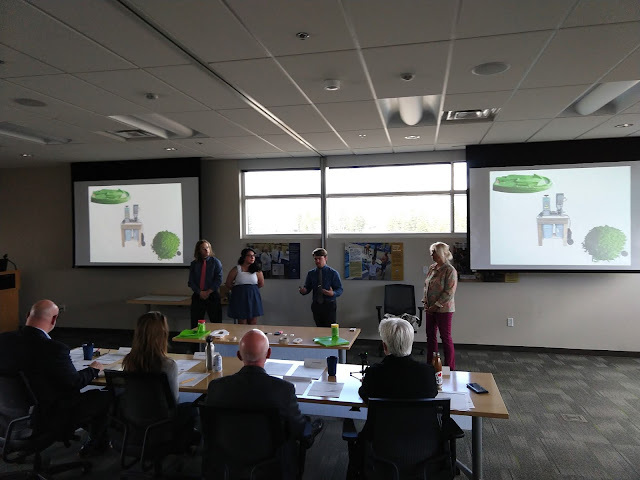 To get this support of our city and its business incubator partner, we were invited to many "launch and learn" seminars since last fall, submitted a written proposal including business plan, and finally 'pitched' the project to a panel of four judges. Thankfully our plastic recycling business pitch won out over two competitors! We will be working closely with NACET (Flagstaff's business incubator space) going forward to tackle the transition from thesis project to local manufacturing business. NACET thankfully offers incubator workspaces for businesses, so we are looking at funding sources for that and other important factors. Watch this space as we progress. I'm aiming to grow this into a major producer of plastic items for Northern Arizona! It's a tall order but a lot of people are rooting for us. 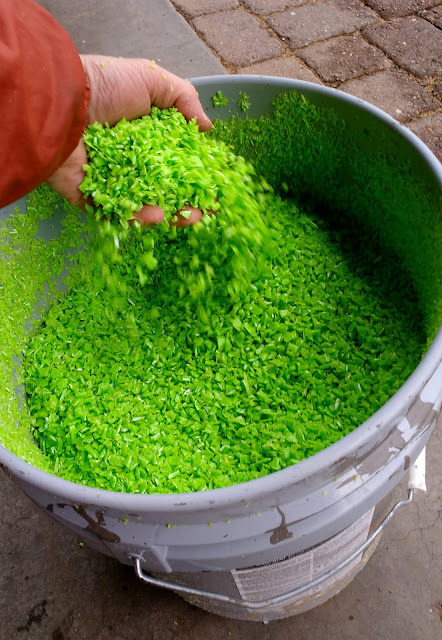 For instance, we plan to use the Innovate Waste funding to acquire an industrial-scale shredder and injection molder so that we can dramatically up our productivity and offer competitive prices. We are talking with other local businesses to secure both clean plastic waste streams and to find a workable product idea that we can jump into production with as soon as possible. 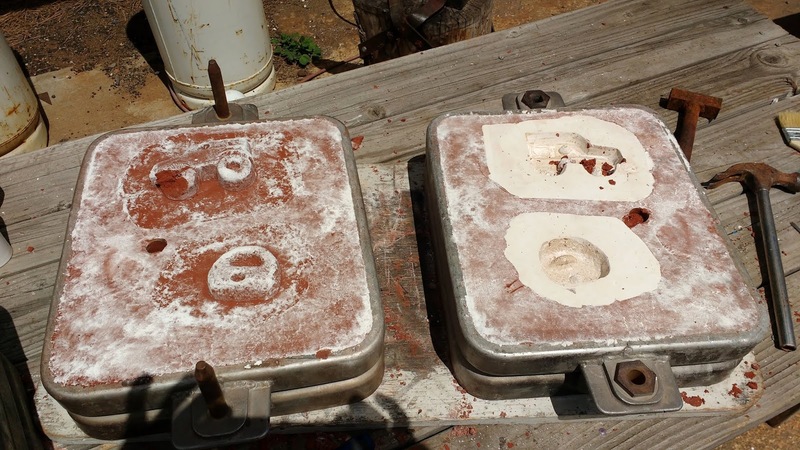 Sand Casting is a complex process for someone like me (and likely you) who has never done it before. Here's the quick rundown. 1. 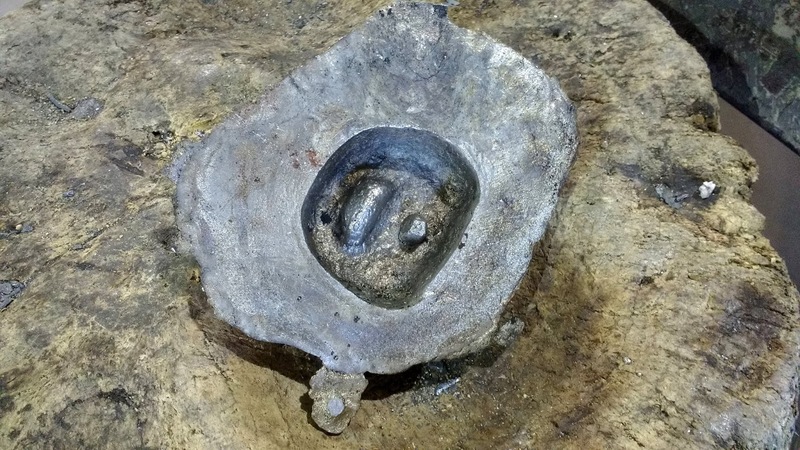 Remember those plaster casts of the clay parts? Flip those upside down on a board and put the bottom half of the sand box (called a flask? I'll call it a box) upside down as well. Sprinkle it liberally with baby powder as a mold release. 2. 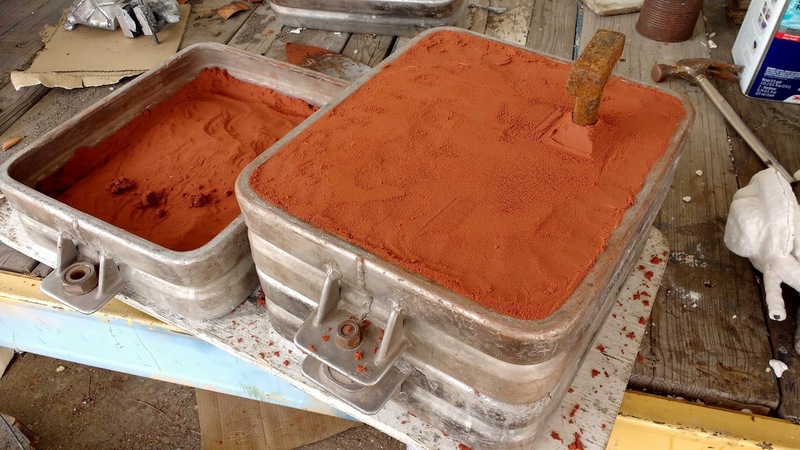 Pack foundry sand/casting sand in, about an inch in depth at a time. Push it down with your fingers and then pack it in with a small tamper. All the air holes need to be gone. Keep packing sand until it's up to the top, then level it. 3. Flip this half of the box upside down. 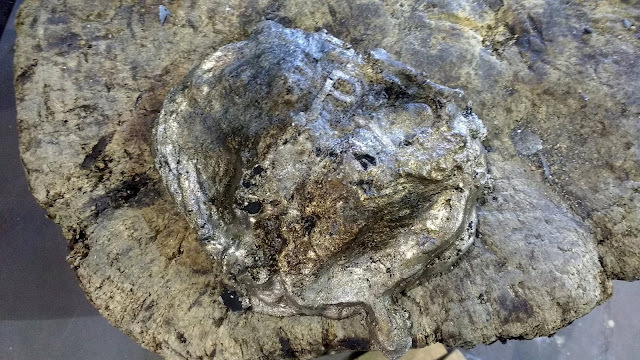 We can see the sand is packed tightly enough that it stays in place and the female side of each plaster mold is visible and upright. 4. Stack on the second half of the box and dust liberally with baby powder again. This is a good time to plan where you will pour the aluminum. 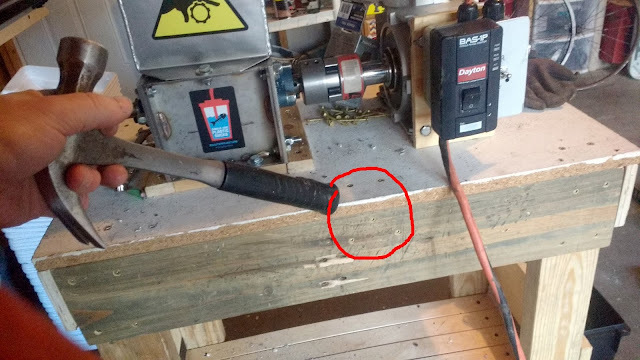 To make the pour hole I put the pipe end of a crude hammer down. 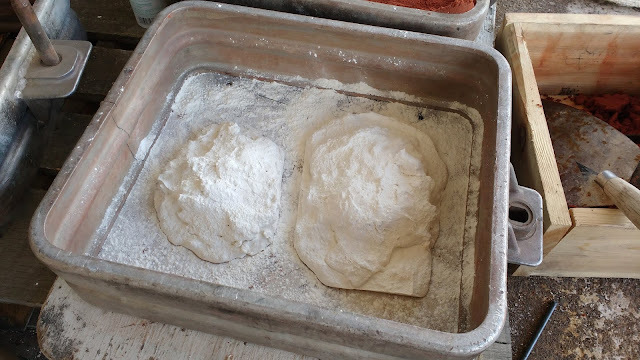 In a later step we will make channels to feed the two parts. Later we will also make vent holes. 5. 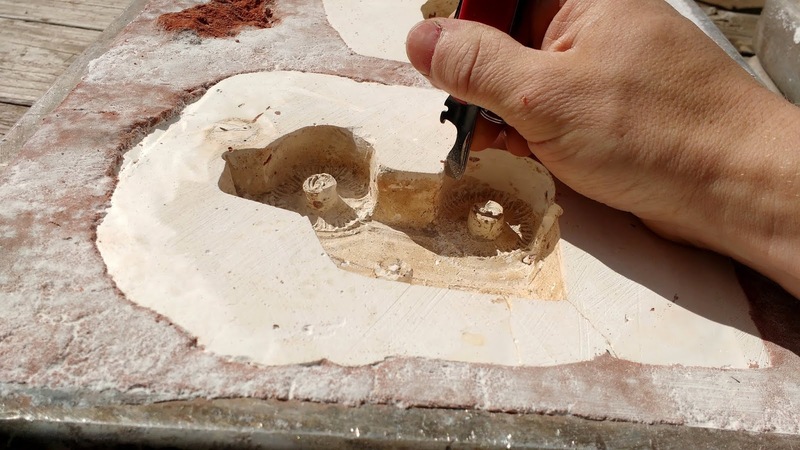 With the pour/feed hole set in, pack the sand in, being careful to completely fill the plaster molds. Keep packing layer by layer until this one too is level. Now the entire box is filled with packed sand- almost 100 pounds (45 kg) of it! 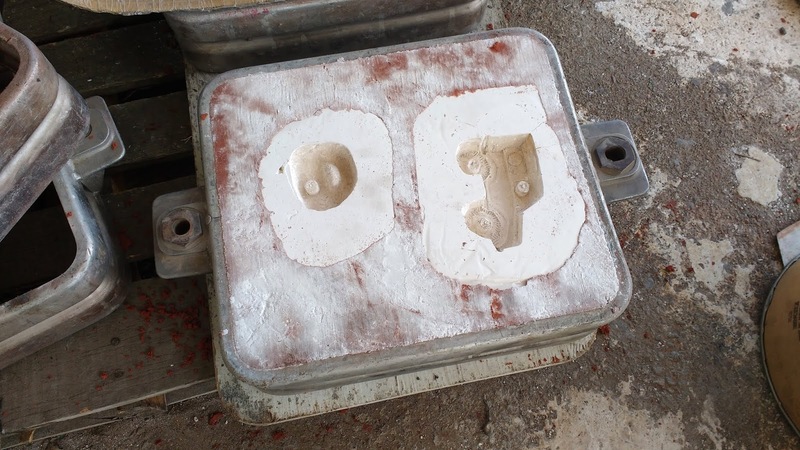 In the middle of course are the two plaster molds ensconced in baby powder, with a thin layer of baby powder also separating both boxes of sand. Next Steps: I write this on Thursday. On Monday I will be pulling these apart, punching in vent holes, adding feed runners between the parts, refining the feed hole, and (with luck on my side) pouring aluminum! 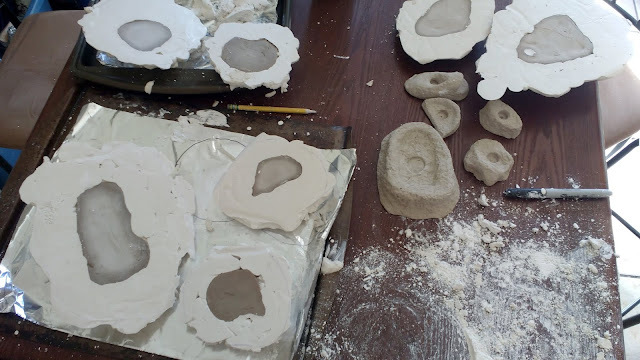 After that I'll be packing the other box with three other plaster molds. I'm hoping that I will be able to pour at about 9am, remove the sand, pack it into the second box, and pour again before leaving around 3pm. At that point I could walk home and do any finish work on the aluminum using a Dremel and other tools. Wish me luck! Shredder Bracing & Some HIPS Flakes! I noticed that the elastomer in my Lovejoy coupler kept shredding itself apart, and at $30 each I do not want to keep buying them every couple work days. 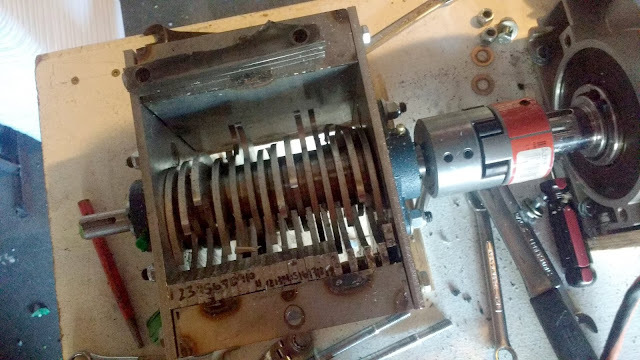 It appeared that it was getting damaged when binding up, and that the motor/gearbox assembly was leaning itself away from the shredder, and actually bending the table top in doing so. The little 2x4 braces on the edges helped, but I needed a heavy duty solution. 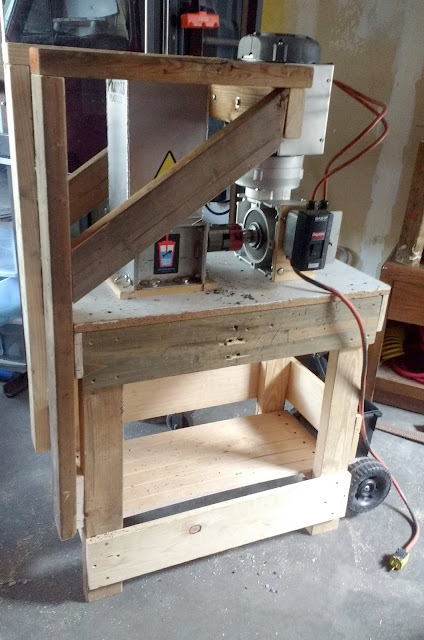 So I built an upper frame to triangulate the top of the motor with the rest of the table. 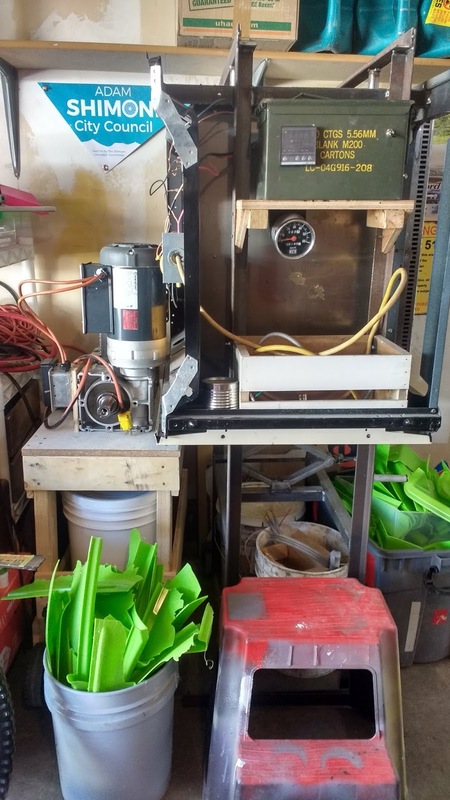 This makes working with the shredder (and clearing jams) more difficult, but so far it's helping the elastomer last longer because the motor can't move as much in relation to the shredder or the table. In happy news, I've shredded very nearly all of my stockpiled HIPS (High Impact PolyStyrene) printer parts! 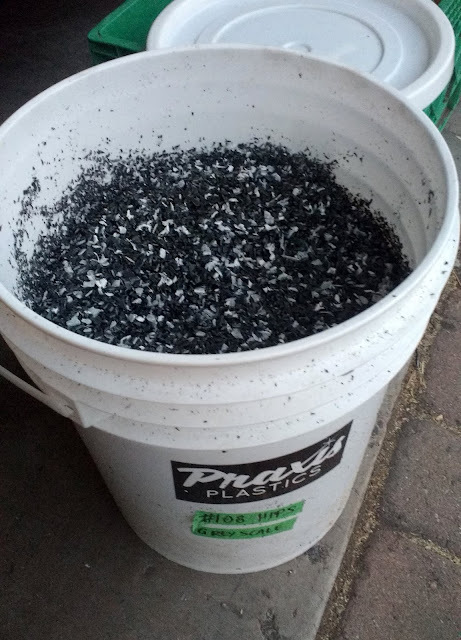 This is probably 4 gallons of the 5 gallon bucket, and it's multi-colored black, grey, and white. I'm excited to make some sheets out of it ASAP. New Machines! 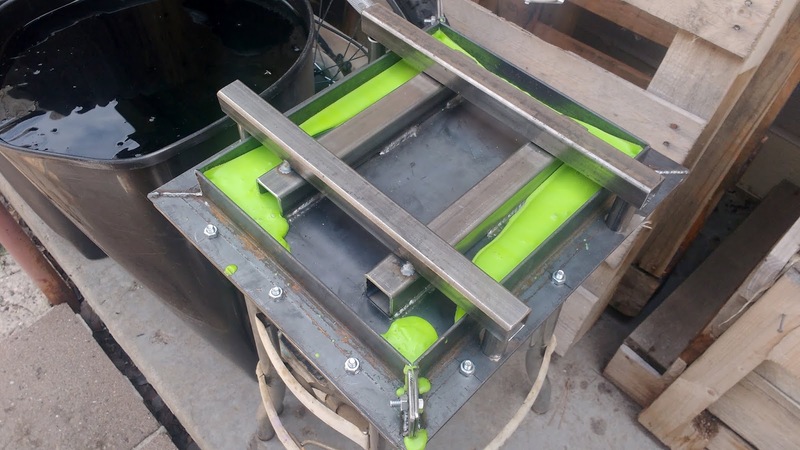 Injection Molder and Extruder. After a few missed shipments of the machines from Precious Plastic USA (not PPUSA's fault) I decided it would be easier to 'simply' drive down to Phoenix to pick them up myself. But my truck is broken for now, until I have time this summer to fix certain important things. So I borrowed my roommate's Ranger to make the drive down 5900' (1800m) in elevation and then back up. It ended up working alright and we made it back to Flagstaff with both machines for about $45 in fuel. The injection molder mounts on the wall, with its frame built to line up with 16" spaced wall studs for easy mounting. You can see the control board is made from recycled plastic- cool! The giant lever is what you use to inject the plastic. 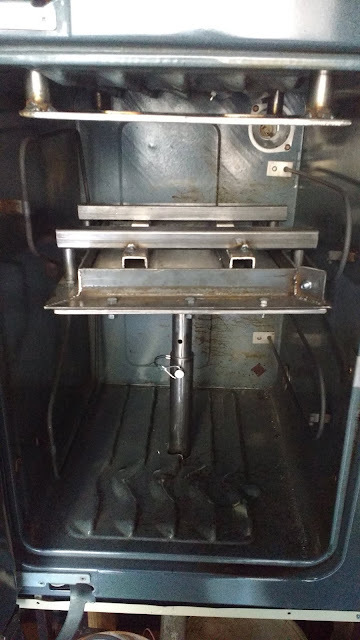 For storage it locks straight up. I calculated that this machine can probably inject about 27 cubic inches (442 cc) of plastic based on its piston travel. 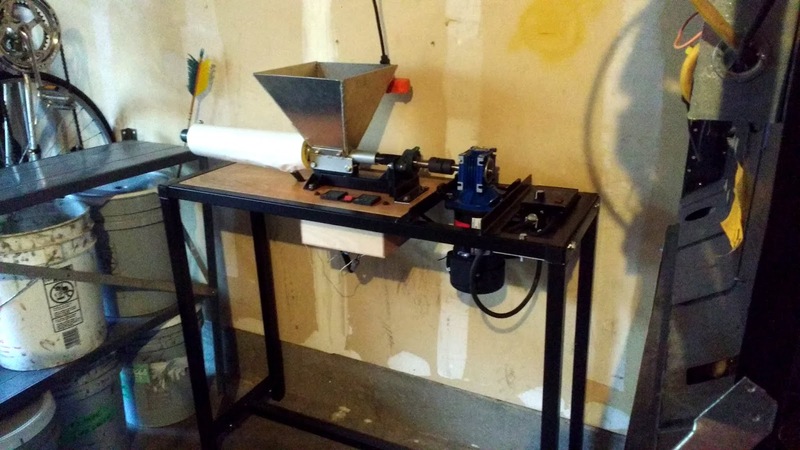 The extruder has its own modular table. You can see the motor and small gearbox on the right. I have not had the chance to try out either of these yet, unfortunately. But the climbing holds will be made with the injection molder. 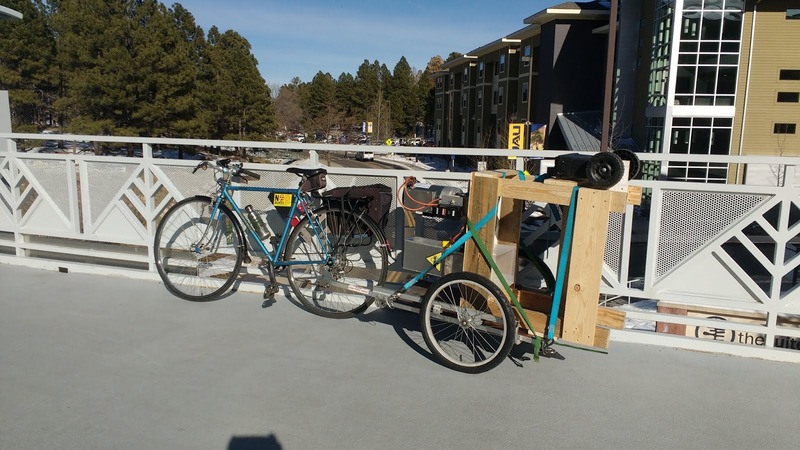 Regular readers may remember that I'm getting independent study credit to work with a local sporting goods store, Snow Mountain River, to create climbing holds out of recycled sleds. A few weeks ago I enlisted the help of some friends and their friends to sculpt these climbing holds out of clay. We ended up with over 15 different holds, which had to dry overnight. 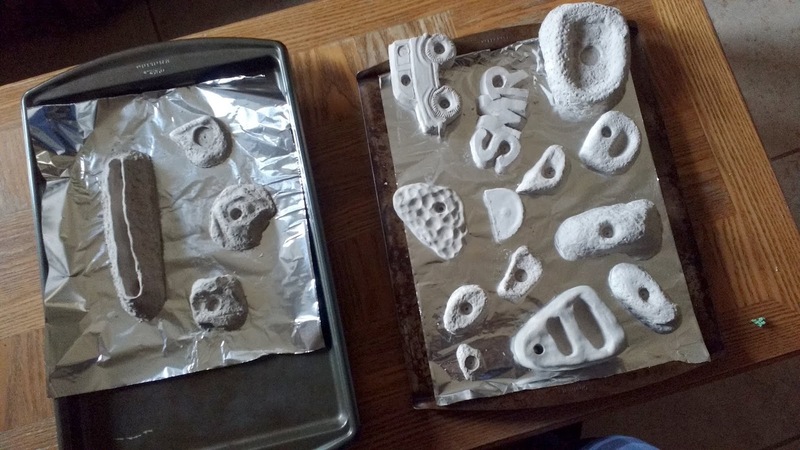 Next step was to mix up some plaster of Paris to slather all over the dry holds. The plaster then had to dry. Pro tip: put down aluminum foil before you sculpt and again before you plaster; it'll make removal easier. 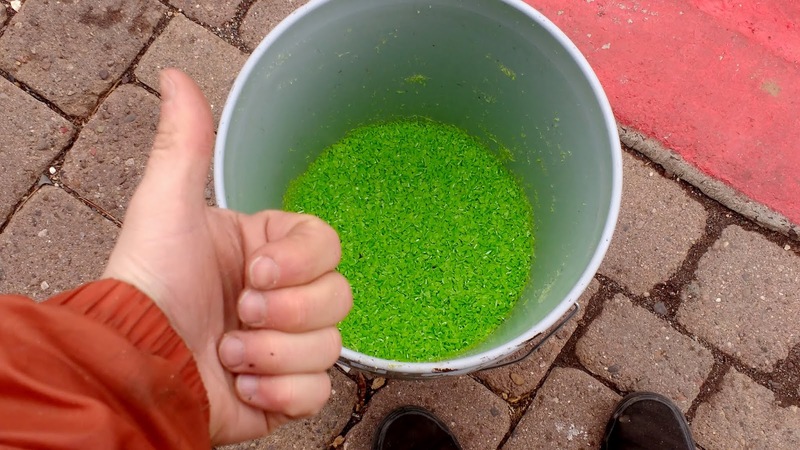 Also, mix the first layer of plaster with more water than you think it needs. You want it to get into all the cracks and you definitely don't want air bubbles. The other layers can be a little thicker if necessary, but make sure that first one is almost watery! The plaster will likely feel cold as it sets and the moisture evaporates out. You will also see the edges of the clay looking dark before everything is dry. Give it at least 24hrs to be sure. Then flip them over. 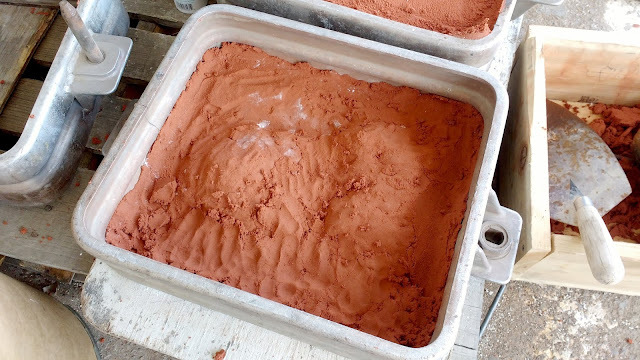 If you can get the clay out by gentle means, go for it. I found it was stuck in there pretty well, so I tapped on a flathead screwdriver like a tiny, gentle jackhammer for hours to get all these things out. It destroyed the clay. Be very careful to chip away from the plaster as you chip, and only get small pieces at once. It's easy to chip your plaster. Watch this space for the next part. First of all, I decided to start rocking on the giant box full of HIPS that's been sitting in the living room. 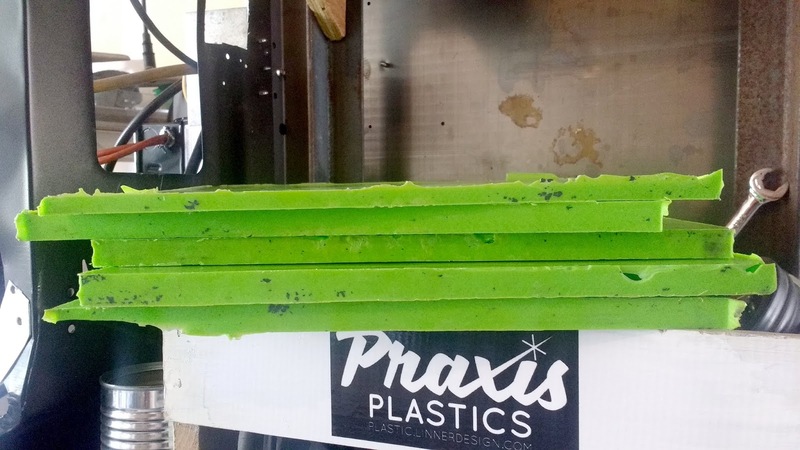 High-Impact Polystyrene (aka PS-HI) is a firm plastic that's less brittle than standard PS. I've been finding it in printers, where it does a great job in many parts. However it also does a really good job of jamming my shredder! This was the worst jam yet, making me disassemble the shredder enough to pull several spacers out. You can see them sitting on the shredder. 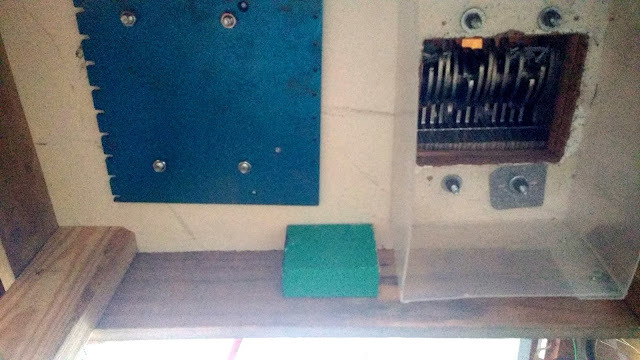 I also looked at a recurring problem I've been having- that of ruining the elastomers in my Lovejoy coupler (red-orange thing at right). 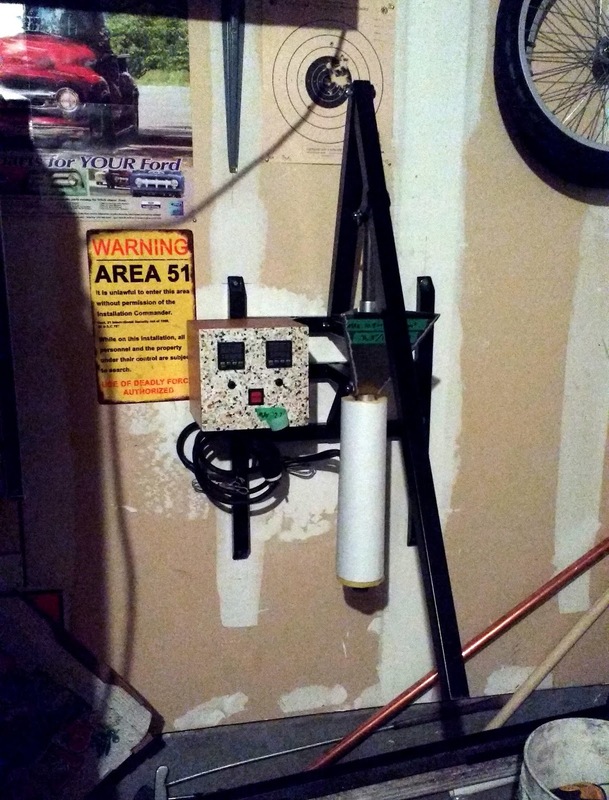 The coupler has been properly spaced but still has eaten that black elastomer spider, resulting in $30 of expense for a new spider as well as about a week of downtime before I could buy a new one. I realized the thing HAS been going out of alignment, but not because of bad adjustment. The table has actually been flexing upward when the shredder encounters high resistance. To solve this problem and stop spending money, I threw some short 2x4 braces into the middle of the table. Here you can see the five screws I sent through the table. These line up with the coupler. Below is a view from underneath the table. On left is the blue piece of aluminum that braces the motor. 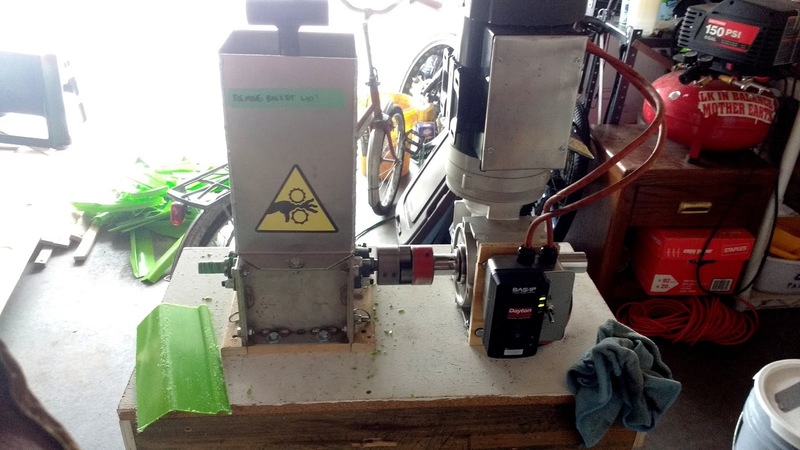 On right of course is the shredder, and at the bottom you can see that short bit of 2x4 recycled from a part of last year's 4P project. I could send a 2x4 all the way across underneath the table, but it would be more work. We'll see if this works, and if not I'll figure something else out. I did a little more shredding after that and noticed that it did reduce flexing on the coupler. However the motor and gearbox tend to flex. I'm not sure how to fix that except for bracing near the bolt holes. If that became a problem I might look into steel tabletops. I don't anticipate having to do all that though. It seems like it'll work fine. Tour of the Sheet Mold! 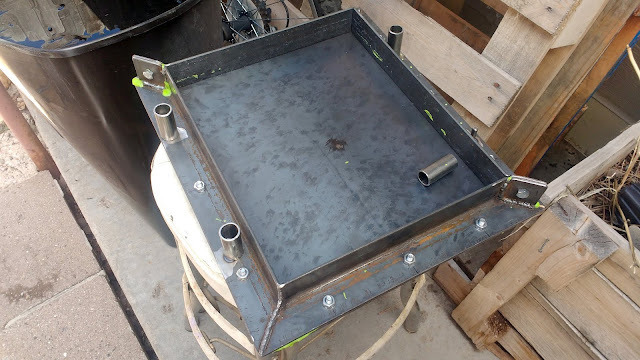 And now for a quick tour of my sheet mold designed and built by Artisan Metal Works of Flagstaff, AZ! 1. Filling the Mold. Install spacers of desired thickness. Pour in appropriate volume of flakes, about 3-4 scoops from an old chip-dip container in this case. 2. Topping it off. Put the upper portion on! This is a flat sheet topped with box section tubing. When the plastic is melted, I crank the jack under the oven, which smashes this mold together until the tubing hits the spacers. At that point I know the plastic sheet is of uniform thickness. 3. Melted & Cooled. The excess plastic squeezes around the edges, filling up the sheet entirely. At this point the plastic has usually contracted enough to let me pull the top right off, with sheet attached. If not I can unbolt the sides to really get everything free. 4. End Product. Here are five sheets I've made so far! These are all made from broken sleds collected from the forest. The top one is a thinner version with my short spacers. I'm hoping to experiment with a thicker one too. These are about the size of a clipboard, but maybe not long enough to actually use for that purpose. 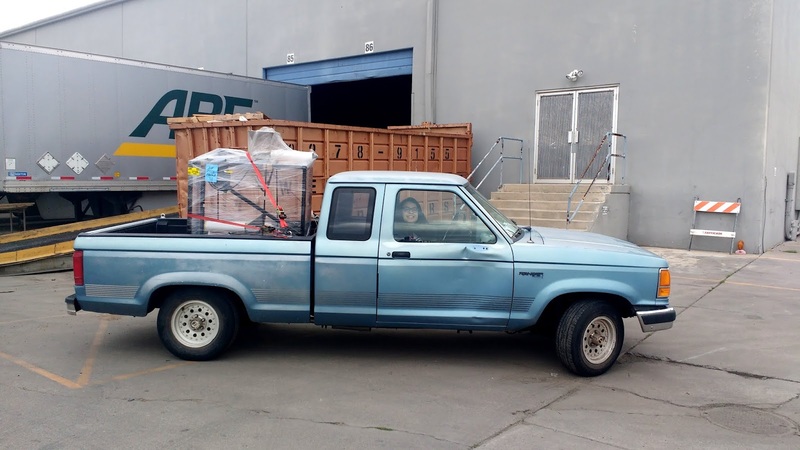 Oven Comes Home for Good! Boy am I glad to have the oven finally! It came home on 19 February and I've been playing with it since. Thanks to Artisan Metal Works in Flagstaff for helping me out on this. They've done great work at a price that works for my project. Above, of course, is the sheet mold inside the oven. This is a four-part system with removable spacers as well. All very modular and nice. Check out the next post for a tour of the mold. Here is a photo of my oven and shredder tucked away in the garage. unfortunately I don't have much room so they have to be really crammed in there! 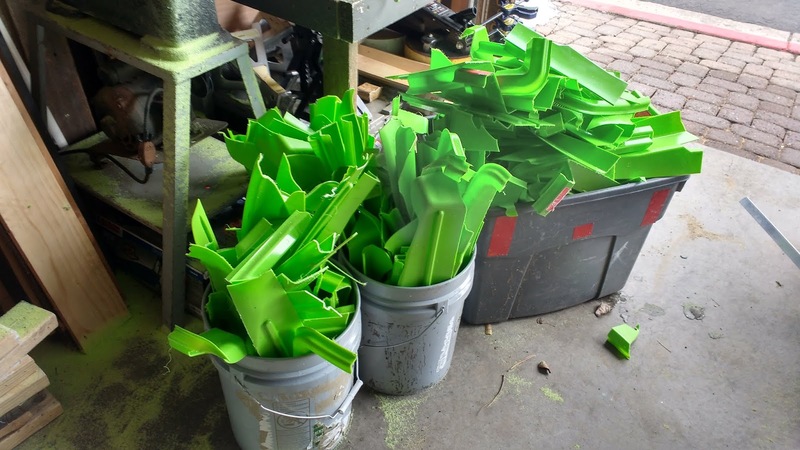 You can also see bins full of broken HDPE sleds- all Paricon Model 648's. I suppose it was one month ago now, but time has been flying. I hauled my shredder over to Snow Mountain River who I'm partnered with, and put on a little demonstration for them. You may notice I added some needed structural elements to the lower part of the table. This helps keep it from twisting too much with the torque of that 1-1/2hp motor. 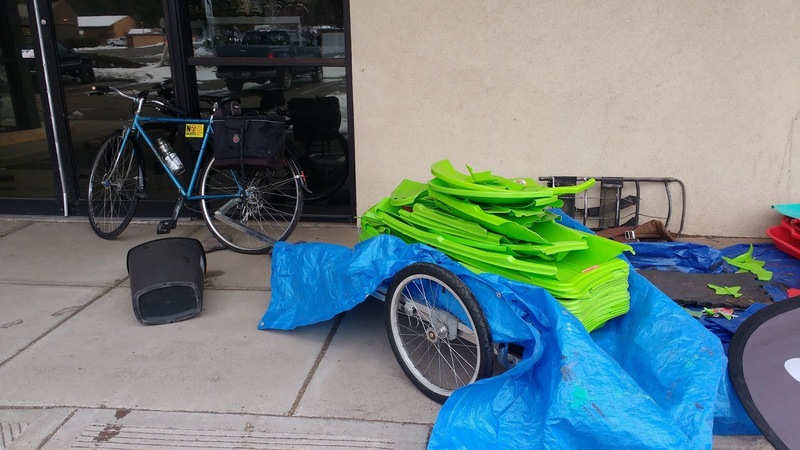 I'm also happy to report that though it's heavy, the shredder pulls pretty well on the bike trailer! It was only a two mile ride but included a few hills. I did a demonstration at SMR on February 13th! The weather wasn't great so the turnout wasn't as good as I had hoped, but one person who came was Michelle Sevigny of local radio statio KNAU! Here is the resulting interview.